Atop a scenic bluff overlooking the Mississippi River and downtown Dubuque there once lay a graveyard dating to the 1830s, the earliest days of American settlement in Iowa. Though many local residents knew the property had once been a Catholic burial ground, they believed the graves had been moved to a new cemetery in the late nineteenth century in response to overcrowding and changing burial customs. But in 2007, when a developer broke ground for a new condominium complex here, the heavy machinery unearthed human bones. Clearly, some of Dubuque’s early settlers still rested there—in fact, more than anyone expected. For the next four years, staff with the Burials Program of the University of Iowa Office of the State Archaeologist excavated the site so that development could proceed. The excavation fieldwork was just the beginning. Once the digging was done each summer, skeletal biologist Robin M. Lillie and archaeologist Jennifer E. Mack still faced the enormous task of teasing out life histories from fragile bones, disintegrating artifacts, and the decaying wooden coffins the families had chosen for the deceased. Poring over scant documents and sifting through old newspapers, they pieced together the story of the cemetery and its residents, a story often surprising and poignant. Weaving together science, history, and local mythology, the tale of the Third Street Cemetery provides a fascinating glimpse into Dubuque’s early years, the hardships its settlers endured, and the difficulties they did not survive. While they worked, Lillie and Mack also grappled with the legal and ethical obligations of the living to the dead. These issues are increasingly urgent as more and more of America’s unmarked (and marked) cemeteries are removed in the name of progress. Fans of forensic crime shows and novels will find here a real-world example of what can be learned from the fragments left in time’s wake. Robin M. Lillie has worked as skeletal biologist for the University of Iowa Office of the State Archaeologist Burials Program since 1989. Her primary responsibilities are the analysis of prehistoric human skeletal remains and assisting the Burials Program Director with the protection of Iowa’s ancient burials. Her interest in human skeletal remains began in graduate school, when she had the opportunity to work on forensic cases with her thesis professor. She served as project manager and on-site director for the excavations at the Third Street Cemetery in Dubuque, Iowa, and directed all laboratory analysis for the project. She has lived in Iowa City since 1989 and has three adult children. Jennifer E. Mack has been working in the field of archaeology for more than fifteen years. She has participated in excavations across the United States, as well as in Ireland, Germany, Kazakhstan, and Uzbekistan. 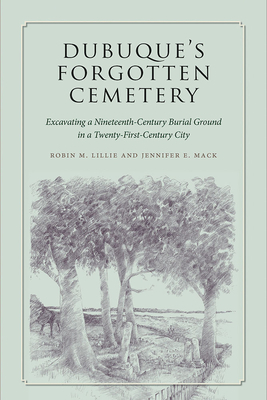 Her lifelong interest in burial grounds began with her childhood explorations of cemeteries like St. Michael’s and St. John’s in her hometown of Pensacola, Florida. Though she is happy digging any kind of site, she specializes in excavating and researching historic American graveyards. Human osteology is her other vocation. While at the University of Iowa, she analyzed human remains from Bolores, a Neolithic rock-cut tomb in Portugal, as well as the materials from the Third Street Cemetery. When not working on projects elsewhere, Jennifer still lives in Pensacola.